Bout of Books does not endorse any giveaway that is not listed on the schedule page. Though Bout of Books approves challenge hosts and prizes, we assume all hosts follow our guidelines and adhere to any laws governing their giveaway. We do not take responsibility for any issues arising from those giveaways. Bout of Books does not endorse any book that is offered as a prize or mentioned and/or retweeted during chats and/or social interactions. All book recommendations are just that: recommendations. These recommendations are based on personal enjoyment and should be regarded as such. 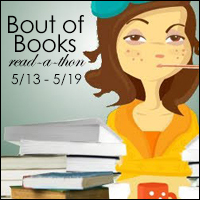 To be eligible for the Bout of Books Grand Prize, you must be listed on the Official Sign Up page for the Bout of Books that is currently running and be actively participating in the read-a-thon. You must be at least 18 years old or older. Your information will not be shared with anyone and you will only be contacted if you are a winner. Your entry may be verified and if the entry cannot be verified it may be removed. The giveaway begins at 12:00am CST on day one of the read-a-thon and ends 12:00am CST the day following the final day of the read-a-thon. Value of prize will be listed in the terms and conditions of the current read-a-thon's Rafflecopter form. Winner will be announced on the Bout of Books blog and then contacted via email. Winner has 72 hours to respond to the email or a new winner will be chosen.